This article is 2735 days old. ART.WORK presents its second workshop of this seasons series this Tuesday. 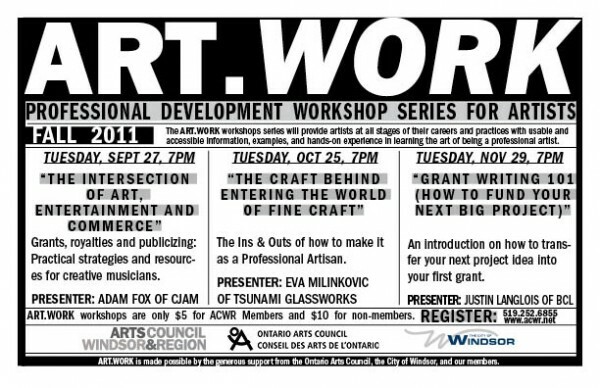 ART.WORK is a monthly professional development workshop series led by approachable and knowledgeable local artists and experts for all members of Windsor-Essex’s artist communities, presented by the Arts Council Windsor & Region. If you are a crafter or local artisan then Tuesdays workshop is for you. “The Craft behind Entering the World of Fine Craft” The ins & outs of how to make it as a professional artisan. The evening presenter will be Eva Milinkovic of Tsunami Glassworks. Eva will be reviewing the basics of how to get yourself into the craft market, including available grants and granting bodies for craft persons. ART.WORK workshops are only $5.00 for ACWR Members and $10.00 for non-members. Register now, as space is limited!